Remember when we used to hear of a new condo development practically every week back in the day. At one point, there were 30 or so projects planned, or being dreamed of, that were forever going change the cityscape. A reader wanted to know and asked if I’d do a follow-up to this Midtown post. Here’s what I’ve got so far. Heron / Pagoda: Twin condo/hotel project at 5th & Stewart – Dead, with the property having gone into foreclosure. The Martin: Vulcan’s cinematic condo at 5th & Lenora – Indefinitely tabled. As far as I know Vulcan still owns the property and could develop it during the next construction cycle. 7th & Westlake: An office/condo combo – It was pretty much a goner when I wrote about it back in 2007. 2105 6th Ave: Twin tower apartments – I have no idea. I assume financing and competition (Aspira, Olivian) kept this on the sidelines. Update 8/31/09: Per a Seattle Business magazine article, Sixth & Lenora Apartments are expecting to break ground next year with leasing beginning in 2011. It’s good to get an update but the timeline seems ambitious. Icon Tower: a sleek condo tower on a tiny footprint at Denny & Wall – Dead. There’s a “For Sale” sign on the lot now. Hyatt Place: an interesting mix – hotel and apartments – currently under construction at 6th and Denny. Rollin Street: Vulcan’s brick at Denny & Westlake – Converted to apartments. Equinox: nearing completion on Eastlake – Converted to apartments. I just confirmed this today. Presale buyers are being given the opportunity to purchase homes at a discount at other Schnitzer properties such as Brix and Gallery. Those choosing not to purchase will be refunded their earnest money deposit. 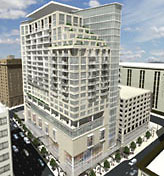 Seneca Towers: a twin tower condo project at 8th & Seneca – To be developed as apartments. I happened upon a property management website showing the property renamed the Park Seneca, its original name. Stewart and Minor: Dead. The property was put up for sale. 1 Hotel and Residence: at 2nd and Pine – Comatose, possibly dead. Financial difficulties, the concrete strike, construction financing and not meeting the city’s use ordinances did this one in. Now, the great hole of Seattle. AVA: at 8th and Pine – Comatose. Not really sure, but nothing is likely to happen until the next construction cycle. Insignia Towers: Vancouver does Seattle at 5th and Battery – don’t know. Hoping this one goes through. Developer paid $50M for the lot which is being used to house cars and DOT equipment. Art House: at Battery and Elliott – apparently Dead. The project is no longer on the developer’s website. 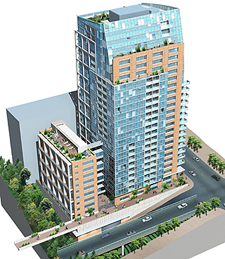 2015 2nd Ave: a 40-story residential project adjacent to Cristalla and One Pacific Tower – the parcel is listed for sale. Moda: small and affordable in Belltown – Converted to apartments. Unfortunately, during construction the units shrank from their already small size. The jury is still out on Olive 8. Closings have slowed to a crawl. 1 one hotel and residences = the architecture firm (sienna architecture) behind the project filed for bankruptcy in january. We had several project cancelled here in the Dallas area. I am sure once everything settles we will start hearing about them again. one of the biggest, oldest, and most famous buildings in Oahu just filed for bankruptcy, the Ilikai. it’s the building that used to be on the intro scene to Hawaii 50. There are like 100 units for sale in there now, as the hotel part was shut down and the place was in big trouble. Somebody lost a TON of money trying to bring it back to its former glory. Hawaii Homes – that’s a little sad really. Being from Honolulu I have fond memories of the Ilikai. Interestingly, the Ilikai had been a hotel & condo for decades before they became faddish in the past few year. I wonder if there are plans keep the hotel portion going or covert the whole building to condos? There are also a number of Phoenix Condo Projects that are in foreclosure or eventually will be based on the dismal sales. The unfortunate part of things here is many of these vacant units will turn into rentals for a while when the projects are liquidated for 30 cents on the dollar. Downtown Phoenix does not have the established urban lifestyle that Seattle does so I suspect Seattle will come out of this mess much sooner which is good for you. That said, someones loss is always another’s gain. So, for those who only dreamed of affording a place in the city, now is the opportunity you have been waiting for. Seneca Towers is on hold due to lack of financing. The building on the site still hasn’t been completely removed and it looks like demolition has been halted. I noticed that Alex (1st & Bell) wasn’t mentioned. I wonder if that ever will be completed (I haven’t seen any progress there in the last month or so and their website is down (someone forgot to renew the domain name)). I think Laconia (Levin Menzies) is dropping out of the Seattle market (Seneca Towers and Icon)…who knows what will happen to that parcel. Alex is still going forward. I spoke with the sales rep last week, they won’t pursue a significant marketing campaign. I told them the domain expired as well. Hopefully I’l be able to tour the site soon and will write a review. The Charlotte area hasn’t been affected by the real estate downturn as bad as larger cities, but we’re beginning to see condo developments fall by the wayside, too.